Andrew Pilkington in his URI dorm room. “I don’t think I live my life any differently than anyone else,” he said. KINGSTON, R.I. — Andrew Pilkington had an early start running the show. Born with cerebral palsy, he was about 3 when he began creating a world out of Playmobil and Lego toys. A grown-up would arrange the pieces precisely as the boy wanted them. His room in the family’s Wayland, Mass., home became a movie set. He did not stop there. 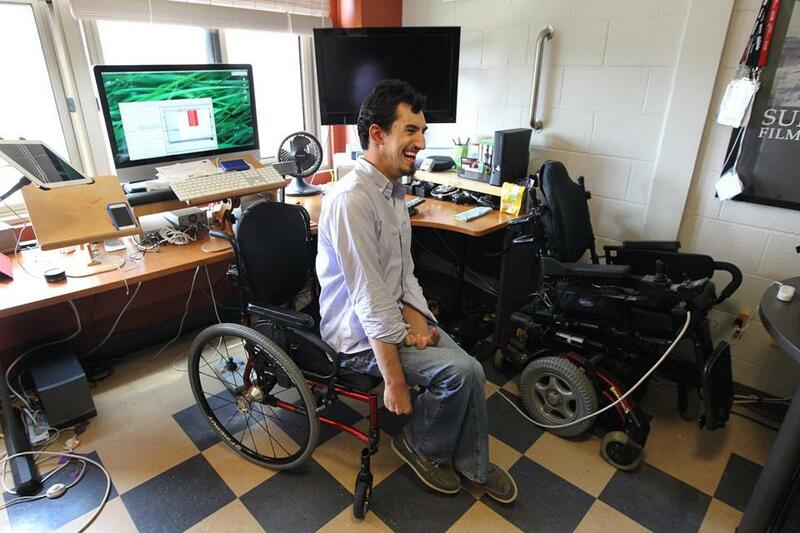 “I try not to think of myself as a disabled person, but rather a person who happens to have a disability, and I don’t think I live my life any differently than anyone else,” he said. His condition makes it difficult for him to speak and renders him unable to fully control movement of his arms and legs. But Pilkington does not pause for self-pity or spend too much time thinking about what he wants to do. He just does it. 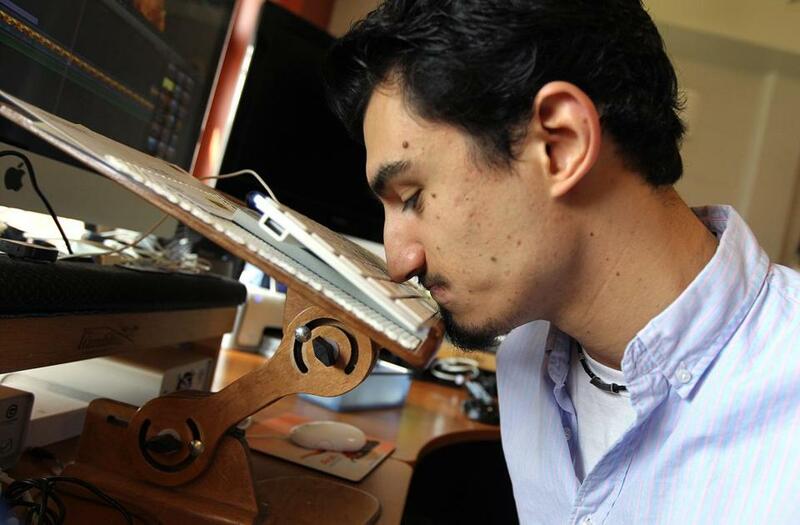 He types with his nose, and he manipulates the computer mouse and clicks with his right foot, using a joystick and green button on a pad on the floor. He usually directs from his wheelchair. In addition to “Kings,” a tale of a bored young guy in a quiet town drawn to a perilous fast lane, Pilkington has written and produced another movie, “Good Friday,” about an idealistic student who discovers the disappointing reality of his school’s government, and a series of videos showcasing how people with disabilities are using technology to level the playing field. He can crank out a 120-page screenplay in three or four months. “I write faster than most people expect,” he said during interviews by e-mail and at his campus dorm, where he lived alone and was helped by personal care attendants with eating and dressing. Andrew Pilkington has a collection of photographs of himself with celebrities at the Sundance Film Festival. 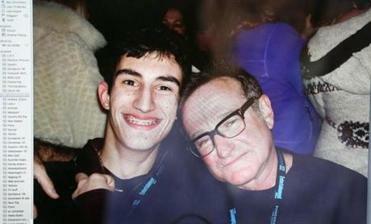 Here, he poses with Robin Williams. Hard-working and personable, with a smile that can light up a room, Pilkington was one of a select group of students at URI’s Harrington School of Communication and Media hired to represent and promote the school and serve as peer advisers. He also helped organize events and was the go-to guy for editing videos. “He has a good eye, a good sense of how to put images together,” said Tom Zorabedian, assistant dean of the College of Arts and Sciences and the Harrington School. Pilkington credits his family with nurturing his creativity and confidence. His parents helped him launch Ruby Andromeda Productions a few years ago. His father, Chris Pilkington, is a health care executive, and his mother, Deborah Ciolfi, does financial planning for foundations and endowments. Andrew’s 17-year-old sister, Graziella, also known as Grace, attends Brimmer and May School in Chestnut Hill. At 10, he was watching satirist Jon Stewart and the television series “The West Wing.” He got involved in school politics and served on his class executive board at Wayland High and the student senate at URI. “He was active and aware,” said his mother, who took him to the Sundance Film Festival in 2007, when he was a high school freshman. Pilkington returns to the Utah festival yearly and has met many stars, including Robert Redford, Bobcat Goldthwait, Robin Williams, Pierce Brosnan, and Louis C.K. In 2008 and 2009, he took screenwriting courses at a summer camp at UCLA, an experience he describes as a turning point in his life. Writer and producer Jordan Moffet, then an adjunct professor at UCLA, sees in Pilkington great determination, among other attributes. Pilkingtonreleased the remake of his "Suburban Kings" in 2011. Pilkington doesn’t work all the time. He hangs out with friends and is a wiz at video football (yes, playing with his foot). A big Boston sports fan, he has been to countless Celtics games and went for a spin on a Zamboni at a Bruins game a few years ago. Speaking of wild rides, “Suburban Kings” received an honorable mention for screenwriting at the 2012 Los Angeles Movie Awards. The film, pulsating with hip-hop and enough spicy dialogue to make a wiseguy blush, was filmed mostly in Wayland. In a scene reminiscent of one of Pilkington’s favorite movies, “Goodfellas,” a guy answers the door with a shotgun and then offers the startled visitor some turkey. The shotgun chef is played by Pilkington’s URI classmate and pal Tyler Nauffts, from Haverhill. The scene was shot at the Pilkingtons’ house. The family’s dog, Lacey, is in the film. Another of their pets, a vegetable-munching cat named Frankie who swipes green beans off the table, probably would have fit right in. Not everything has worked. “I definitely learn something new from each movie and use what I learn to improve future movies,” Pilkington said. Pilkington hopes to land an internship writing or editing in film or television, and he might go to graduate school at some point. “My dream is to create my own TV show for a national network,” he said. More success would not surprise his supporters. “He’s got a great sense of humor and a lot of charisma,” said Rob Reddington, his special needs teacher at Wayland Middle School, who invited Pilkington back to speak to his students recently. Andrew Pilkington types with his nose and can crank out a 120-page screenplay in three or four months. Bill Porter can be reached at william.porter@globe.com.